Cruise the mighty Murray River aboard Qatar to arrive at Banrock Station after midday to enjoy a sumptuous meal and local wines. Arrive at Banrock Station before midday to enjoy a sumptuous meal and local wines, then board Qatar and spend the afternoon cruising the majestic Murray River to Waikerie. Cruise the mighty Murray River aboard Qatar to arrive at Caudo Vineyard after midday to enjoy a BBQ Grill and their famous Sangria. Arrive at Caudo Vineyard before midday to enjoy a BBQ Grill and try their famous Sangria. Then board Qatar and spend the afternoon cruising the majestic Murray River to Waikerie. Cruise the mighty Murray River aboard Qatar to arrive at Overland Corner Hotel after midday to enjoy a sumptuous meal and local wines. Arrive at Overland Corner Hotel before midday to enjoy a sumptuous meal and local wines, then board Qatar and spend the afternoon cruising the majestic Murray River to Waikerie. Enjoy a cruise downstream on board Qatar to Lock 2. 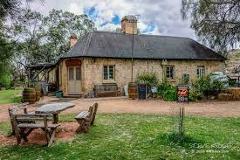 Then take a leisurely walk to the lock and have lunch in the beautiful picnic grounds before cruising back to Waikerie riverfront.